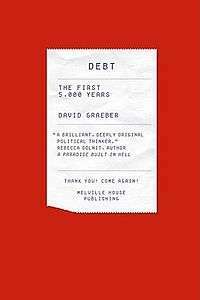 Debt: The First 5,000 Years is a book by anthropologist David Graeber published in 2011. It explores the historical relationship of debt with social institutions such as barter, marriage, friendship, slavery, law, religion, war and government; in short, much of the fabric of human life in society. It draws on the history and anthropology of a number of civilizations, large and small, from the first known records of debt from Sumer in 3000 BC until the present. A major argument of the book is that the imprecise, informal, community-building indebtedness of "human economies" is only replaced by mathematically precise, firmly enforced debts, through the introduction of violence, usually state-sponsored violence in some form of military or police. A second major argument of the book is that, contrary to standard accounts of the history of money, debt is likely the oldest means of trade, with cash and barter transactions being later developments. Debt, the book argues, has typically retained its primacy, with cash and barter usually limited to situations of low trust involving strangers or those not considered credit-worthy. Graeber shows how the second argument follows from the first; that, in his words, "markets are founded and usually maintained by systematic state violence," though he goes on to show how "in the absence of such violence, they (...) can even come to be seen as the very basis of freedom and autonomy." Graeber lays out the historical development of the idea of debt starting from the first recorded debt systems, in the Sumer civilization around 3500 BC. In this early form of borrowing and lending, farmers would often become so mired in debt that their children would be forced into debt peonage. Kings periodically canceled all debts. In ancient Israel, the resulting amnesty came to be known as the Law of Jubilee. The author claims that debt and credit historically appeared before money, which itself appeared before barter. This is the opposite of the narrative given in standard economics texts dating back to Adam Smith. To support this, he cites numerous historical, ethnographic and archaeological studies. He also claims that the standard economics texts cite no evidence for suggesting that barter came before money, credit and debt, and he has seen no credible reports suggesting such. The primary theme of the book is that excessive popular indebtedness has sometimes led to unrest, insurrection, and revolt. He argues that credit systems originally developed as means of account long before the advent of coinage, which appeared around 600 BC. Credit can still be seen operating in non-monetary economies. Barter, on the other hand, seems primarily to have been used for limited exchanges between different societies that had infrequent contact and often were in a context of ritualized warfare. Graeber suggests that economic life originally related to social currencies. These were closely related to routine non-market interactions within a community. This created an "everyday communism" based on mutual expectations and responsibilities among individuals. This type of economy is contrasted with exchange based on formal equality and reciprocity (but not necessarily leading to market relations) and hierarchy. The hierarchies in turn tended to institutionalize inequalities in customs and castes. The great Axial Age civilizations (800–200 BC) began to use coins to quantify the economic values of portions of what Graeber calls "human economies". Graeber says these civilizations held a radically different conception of debt and social relations. These were based on the radical incalculability of human life and the constant creation and recreation of social bonds through gifts, marriages, and general sociability. The author postulates the growth of a "military–coinage–slave complex" around this time. These were enforced by mercenary armies that looted cities and cut human beings from their social context to work as slaves in Greece, Rome, and elsewhere. The extreme violence of the period marked by the rise of great empires in China, India, and the Mediterranean was, in this way, connected with the advent of large-scale slavery and the use of coins to pay soldiers. This was combined with obligations to pay taxes in currency: The obligation to pay taxes with money required people to engage in monetary transactions, often with very disadvantageous terms of trade. This typically increased debt and slavery. At this time, great religions also spread, and the general questions of philosophical inquiry emerged on world history. These included discussions of debt and its relation to ethics (e.g., Plato's Republic). When the great empires in Rome and India collapsed, the resulting checkerboard of small kingdoms and republics saw the gradual decline in standing armies and cities. This included the creation of hierarchical caste systems, the retreat of gold and silver to the temples and the abolition of slavery. Although hard currency was no longer used in everyday life, its use as a unit of account and credit continued in medieval Europe. Graeber insists that people in the Middle Ages in Europe continued to use the concept of money, even though they no longer had the physical symbols. This contradicts the popular claims of economists that the Middle Ages saw the economy "revert to barter". During the Middle Ages more sophisticated financial instruments appeared. These included promissory notes and paper money (in China, where the empire managed to survive the collapse observed elsewhere), letters of credit, and cheques (in the Islamic world). The emergence of the Atlantic slave trade and the massive amounts of gold and silver extracted from the Americas — most of which ended up in the far East, especially China — stimulated the reemergence of the bullion economy and large-scale military violence. All of these developments, according to Graeber, directly intertwined with the earlier expansion of the Italian mercantile city-states as centers of finance that defied the church ban on usury and led to the current age of great capitalist empires. As the new continent opened new possibilities for gain, it also created a new area for adventurous militarism backed by debts that required the economic exploitation of the Amerindian and, later, West African populations. As it did, cities again flourished in the European continent and capitalism advanced to encompass larger areas of the globe when European trade companies and military outposts disrupted local markets and pushed for colonial monopolies. The bullion economy ended with the abandonment of the gold standard by the U.S. government in 1971. This return to credit money increased uncertainties. For the moment the dollar still stands as the primary world currency, though that is not likely to last forever. This status of the dollar is largely based on its capacity to multiply itself through debts and deficits. This may continue as long as (a) the United States maintains its status as the world's preeminent military power and (b) client states are eager to pay seignorage for U.S. government bonds. By comparing the evolution of debt in our times to other historical eras and different societies, the author suggests that modern debt crises are not the inevitable product of history and may be changed. The concept of "everyday communism"
The thing which makes it "everyday" is this argument: "communism is the foundation of all human sociability. It is what makes society possible. There is always an assumption that anyone who is not actually an enemy can be expected to act on the principle of "from each according to their abilities," at least to an extent",:96 which is to say, the extent just described. He proposes studying these practices and says that "The sociology of everyday communism is a potentially enormous field, but one which, owing to our peculiar ideological blinders, we have been unable to write about because we have been largely unable to see it. ":101 Nevertheless, Graeber's ideas were later discussed by journalist Richard Swift as being a type of "a reciprocal economy"—which makes use of the "ethic of reciprocity" or the "Golden Rule". The book won the inaugural Bread and Roses Award for radical literature, and the 2012 Bateson Award of the American Society for Cultural Anthropology. The New York Review of Books called the book "an encyclopedic survey... an authoritative account of the background to the recent crisis... an exhaustive, engaging, and occasionally exasperating book". The Globe and Mail said, "This is a big book of big ideas: Within its 500 pages, you’ll find a theory of capitalism, religion, the state, world history and money, with evidence reaching back more than 5,000 years, from the Inuit to the Aztecs, the Mughals to the Mongols". The Financial Times compared the book to the works of Marcel Mauss, Karl Polanyi, and Keith Hart. The book was reviewed by way of a debate in Jacobin magazine. In the first review, Mike Beggs wrote that while "there is a lot of fantastic material in there," he "found the main arguments wholly unconvincing... Graeber is a wonderful storyteller. But the accumulation of anecdotes does not add up to an explanation, and certainly not one that would overturn the existing wisdom on the subject, conventional or otherwise". In response, J. W. Mason defended the book. He noted that the book's "key themes are in close harmony with the main themes of heterodox economics work going back to Keynes," and that while it is "no substitute for Marx, Keynes and Schumpeter, for Minsky and Leijonhufvud, for Henwood and Mehring... it is a fine complement." He also underscored that Beggs' criticisms are drawn mainly from conservative streams of economics. ↑ Meaney, Thomas (December 8, 2011). "Anarchist Anthropology". The New York Times Book Review. The New York Times Company. pp. BR47. Retrieved December 11, 2011. 1 2 3 4 5 6 Grueber, David (2011). Debt: The First 5,000 Years. Brooklyn, NY: Melville House Printing. ISBN 978-1612191294. ↑ Alison Flood (6 March 2012). "New prize for radical writing announces shortlist". The Guardian. London. Retrieved May 2, 2012. ↑ "David Graeber Awarded the 2012 Bateson Prize". Cultural Anthropology. Retrieved Aug 24, 2013. ↑ Robert Kuttner (May 9, 2013). "The Debt We Shouldn't Pay". The New York Review of Book. New York. Retrieved May 25, 2014. ↑ Raj Patel (Oct 17, 2011). "A key to unlock the door of debtor's prison". The Globe and Mail. Toronto. Retrieved May 25, 2014. ↑ Gillian Tett, “Debt: it’s back to the future”, Financial Times (9 September 2011). Retrieved 13 November 2011. ↑ Mike Beggs (August 2012). "Debt: The first 500 pages". Jacobin Magazine. Retrieved May 25, 2014. ↑ J. W. Mason (September 2012). "In Defense of David Graeber's Debt". Jacobin Magazine. Retrieved November 10, 2015. David Graeber interviewed on CNN's Only The Blog about his forthcoming debt book – July 5, 2011. Johnson, David V. (February 15, 2012). "What We Owe to Each Other An Interview with David Graeber, Part 1". Boston Review. Retrieved February 20, 2012.